It’s February which means it’s Black History Month! Obviously, this history should be taught and celebrated year long, but I love that this month adds an extra focus to some extraordinary individuals. I wanted this post to highlight a few fun ideas that are easily implemented into your classroom. Including a few of my favorite books, tech activities, and of course FREEBIES. 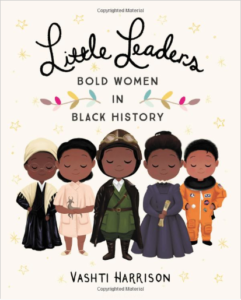 Little Leaders: Bold Women in Black History If the illustrations and the title isn’t enough to make you swoon… I’m not sure what will. This is a beautiful book that highlights “40 trailblazing women who broke barriers of race and gender to pave the way for future generations.” One of my favorite things about this book is your students will get to know already well-known names and stories, as well as everyday women, all who courageously took action to defend their beliefs. With their being over 40 short biographies to read through I think one a day to start the day would be an absolute hit in the classroom! 2. 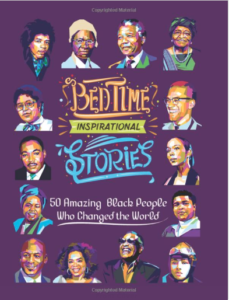 Bedtime Inspirational Stories: 50 Amazing Black People Who Changed the World. Another great option for sharing a short biography each day. These stories highlight how individuals overcame obstacles and adversity. Perfect for a classroom working to instill Grit and Growth Mindset. 3. Now Let Me Fly by Marcia Cebulska A Play Commemorating the Landmark Supreme Court Decision Brown v. Board of Education of Topeka. I LOVE READER’S THEATRE. If you haven’t tried one, please make it a goal. They are so wonderful and fun, and guaranteed your students will thrive. I stumbled across this script and couldn’t wait to share it with you. Before you can access the script you need to decide how you will use it. If you plan to put on a professional production where money or admission is involved in anyway a royalty is required. However if you plan to simply use it as educational royalty is not required! The script comes in 3 different forms, a full version, and 2 youth versions, one for junior high aged kids and the other for elementary. If you have any questions just make note of it in the contact from when requesting the use of the scripts. Click on the link above to access the contact form. If you are looking for a more detailed lesson plan for this script click here! 4. 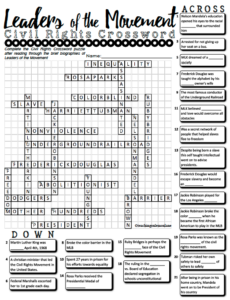 Leaders of the Movement Crossword Puzzle. This Crossword puzzle highlights the leaders of the civil rights movement listed below. Students study a brief but fascinating biography of each leader, then complete a crossword puzzle that tests their reading comprehension of the text. A crossword is always a fun way to increase the engagement when reading text. 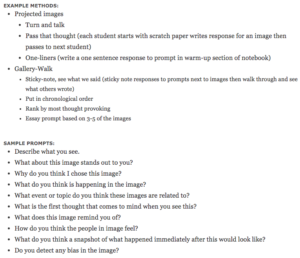 This is a great activity that requires students read the text more than once, as well as go back and forth between the questions and their answers for clarification. Click on the link above for more information. 5. The National Museum of African American History and Culture. Did you know the National Museum of African American History and Culture is “the only national museum devoted exclusively to the documentation of African American life, history, and culture…To date, the Museum has collected more than 36,000 artifacts.” This incredible and interactive museum opened in 2016 and is at the top of my bucket list. Their website and resources are incredible. Students could select one of the stories from the collection series, research, and present their idea to the class or a small group. While visiting make sure to check out the educator tab and explore. There are different options and offers you can apply for, as well as ideas and resources for educators to use in the classroom. 6. 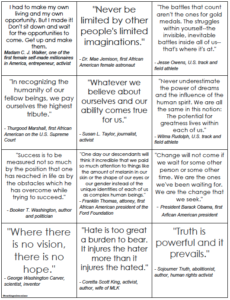 Leaders of the Movement Quote Activity This is a free download available through Teachers Pay Teachers. 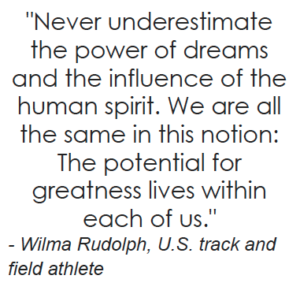 Students will read through impactful and influential words by some of the greatest people to have an impact on Black History. 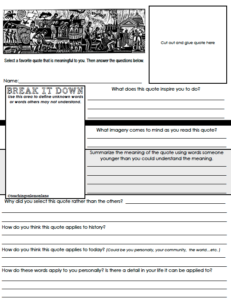 Students will then select their favorite quote, and glue it to the response page. From there they will reflect and respond to the prompts. I love this activity and the discussion that stems from it. 7. Mission US: Flight to Freedom: An interactive way to learn history. I’m always surprised how few educators know about the Mission US. In this game students play the role of Lucy, a young slave with the hopes of escaping to freedom. Students interact with other characters, make decisions, and learn history all while “playing.” Can’t say enough good things about this, your students will love the adventure. 9. 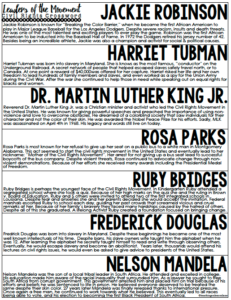 Scholastic Culture and Change:Evolution of Black History is another interactive activity students will enjoy completing. This is set up as a timeline. 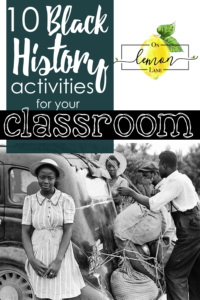 To complete students move through the timeline and read about different things that had an impact or related to Black History. My favorite part about this activity is the Trailblazer segments. Anytime students see a star on the timeline and click on it, they are able to read about this person’s achievements. Scholastic has other great ideas that you can explore here. 10. Leaders of the Movement Portrait Zentangle This is a FREE and exclusive activity to subscribed teaching members here at OnLemonLane.com Click on the link above for more information or if you would like to download the pages simply click here. 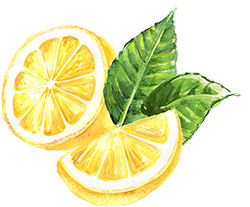 Remember signing up to be a member is free and easy peasy Lemon Squeezy! If you liked the activities above and want more, make sure to check out this post on Dr. Martin Luther King, Jr. activities. Here you will find more freebies and another On Lemon Lane member exclusive. You can also share your own ideas or join in on the discussion happening on the Teaching on Lemon Lane Facebook Group! Phew! I hope you enjoy the activities listed, I would love to hear from you and how they go. I love to be tagged in your students work on Instagram! Happy Teaching!